Spiritualism is the belief that the living can communicate with the dead. The belief in a spirit world and the living's ability to correspond with the spiritual realm probably dates to antiquity. Spirit contact is facilitated when an individual is on his or her deathbed. James Crissman notes in his study of the dying process in Central Appalachia that several dying people had contacts, visual and/or auditory, with a friend or relative who had been deceased for many years. Some had encountered biblical characters. The two greatest premodern spiritualism influences were Emanuel Swedenborg (1688–1722) in Sweden and Andrew Jackson Davis (1826–1910) in America. A well-known scientist and clairvoyant, Swedenborg reported being in constant communication with the spirit world throughout his life. Davis, a clairvoyant, while in a mesmeric (hypnotic) trance, could communicate with the spirit world and accurately diagnose medical disorders. While in a trance he supposedly foresaw the coming of the spiritualist movement. The modern spiritualism movement began in March 1848 when Catherine and Margaretta Fox, after encountering numerous disturbances in their new home in Hydesville, New York, where they lived with their parents, devised a way of communicating with a spirit via the use of a tapping system. The sisters claimed to have discovered that the spirit causing the problem had been robbed, murdered, and buried in the house several years prior to the date that the Fox family moved into the home. Several neighbors were brought into the house to substantiate the fact that the Fox family had communicated with the dead. The press popularized the actions of the Fox sisters and the sisters capitalized on that popularity by turning their abilities to communicate with the dead into a stage act. They attracted the backing of the showman P. T. Barnum, who took them to New York and made them stars. The Fox sisters enjoyed several years of fame as mediums. Following the events in Hydesville, spiritualism became a major international social movement. The Hydesville rappings demonstrated organized communication, the natural mediumistic abilities of certain people, and that communication could be enhanced through the use of a code. The major protagonist was a medium, someone capable of communicating with the dead, who served as the intermediary between the individual wishing to converse with the dead and the spirit of the deceased. The most common form of communication with the spirit world became the séance, which typically took place in a darkened room with participants sitting in a circle holding hands. Occasionally, the medium would be tied to a chair with his or her legs secured, to prevent the use of the extremities to falsely produce ghostly phenomena. The environment of the séance might include sounds of various kinds, the appearance and disappearances of small physical objects, the medium talking in various voices, furniture moving about the room, and a spirit materializing in a temporary physical form. Other séance effects utilized since 1848 are spirit bells and horns, electronic (flameless) candles, lightning and thunder, animated objects such as books or candles, and spirit photography. Methods of communicating with the spirit world, whether or not there is a séance, have included crystal balls, tarot cards, rapping or tapping a code, mental telepathy, a mesmeric or hypnotic trance, the Ouija board, and automatic writing. 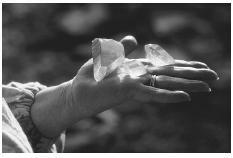 According to New Age spiritualists, crystals contain healing and energizing powers, in addition to promoting communication with spirits. movement grew. The First Spiritual Temple was established by Marcellus Ayer in September 1885. According to Reverend Simeon Stefanidakis, a proponent of spiritualism and author of About the First Spiritual Temple: Hydesville : "The Church became an immediate success, with a membership of over 1,000 people" (2001, p. 3). The spiritualism movement made its way to England in 1852 via a Boston medium, Mrs. Hayden. It was very popular during the Victorian and Edwardian historical eras. The scholar Jenny Hazelgrove notes that it was also popular between the two world wars: "It continued to flourish in the interwar period, given a massive boost by the great war, which left many people desperately seeking to contact the spirits of loved ones killed in that conflict" (Hazelgrove 2000, p. ix). It was strengthened in this time period by support from several members of the Anglican Church. By 1900 the spiritualist movement was dying but enjoyed a minor revival during World War I, and by 1920 spiritualism finally lost its momentum, never again receiving the same level of notoriety—despite the fact that numerous well-known individuals such as Sherlock Holmes author Sir Arthur Conan Doyle and the well-known scientist Sir Oliver Lodge attempted to influence the spiritualist movement's popularity at the beginning of the twentieth century. The spiritualist movement naturally drew many critics. First, there were those who did not believe in the continued existence of the spirit, and therefore scoffed at any notion of communicating with what did not exist. Second, many considered talking with spirits to be a form of mental disorder. Criticisms were strong among members of the medical profession, especially those interested in explaining the human mind. The scholar Alex Owen stated that "the new specialists in insanity were swift to categorize a belief in spiritualism as symptomatic of a diseased mind" (Owen 1989, p. 139). Third, a number of charlatans, whose actions were revealed to be tricks, contributed to the movement's discrediting. This argument was strengthened in 1888 when, in an appearance in New York, Margaretta Fox said that spiritualism was a false science and that she and Catherine had been faking phenomena ever since they had been in practice. Fourth, some people have rejected the idea of communication with the dead because they fear the unknown, which may upset the stability, order, and understanding of the world in which they live. Fifth, numerous men and women rejected spiritualism because of a socialized fear of spirits. Through socialization, people in Western societies, particularly the United States, learn to fear ghosts, goblins, demons, witches, and other members of the spirit world. They avoid cemeteries because ghosts of the dead may prevail and generally believe that morgues and funeral homes are scary places because spirits may still be present. While some Christians have been able to reconcile their religious convictions with a belief in spiritualism, the most vehement criticisms have come from organized Christian groups. While many of the criticisms mentioned have been expounded by organized religions, most opposition to communicating with the dead comes from passages in the Old and New Testaments of the Bible. Numerous passages—including Exodus 22:18, Leviticus 19:31, Leviticus 20:6, and Deuteronomy 18:10–12—provide warnings that communicating with the spirits of the deceased is wrong and condemned by God. The contention is that communication with the dead is to be done through Jesus Christ, not some self-professed medium. There are strong warnings of false prophecy, the existence of malevolent spirits, necromancy and demonic possession, and engaging in spiritualistic methods that make it easier for the devil (or demons) to gain control of one's mind and body. Several religious figures have argued that spiritualists place God in a secondary or nonexistent position. Finally, several religious groups, especially the Catholic Church, were critical of the important role of women in the spiritualist movement and its strong feminist theme. There was even a belief among some spiritualists in a female or perhaps an androgynous divinity. There are several organized spiritualist groups in existence. In the United States in the 1990s there were about 600 congregations with a combined membership of more than 210,000 individuals. The largest organizations include the International General Assembly of Spiritualists, headquartered in Ashtabula, Ohio; the National Spiritual Alliance of the USA in Lake Pleasant, Massachusetts; and the National Spiritualists Association of Churches in Lily Dale, New York. Campbell, John W. "Introduction." 14 Great Tales of ESP, edited by Idella Purnell Stone. Greenwich, CT: Fawcett Publications, 1969. Crissman, James K. Death and Dying in Central Appalachia. Urbana, Illinois: University of Illinois Press, 1994. Doyle, Arthur Conan. The New Revelation. New York: George H. Doran Company, 1918. Hazelgrove, Jenny. Spiritualism and British Society between the Wars. Manchester, England: Manchester University Press, 2000. Kollar, Rene. Searching for Raymond: Anglicanism, Spiritualism, and Bereavement between the Two World Wars. Lanham, MD: Lexington Books, 2000. Leming, Michael R., and George E. Dickenson. Understanding Dying, Death and Bereavement, 5th edition. Fort Worth, TX: Harcourt, 2002. Lodge, Sir Oliver. Why I Believe in Personal Immortality. London: Cassell and Company, 1928. Owen, Alex. The Darkened Room: Women, Power and Spiritualism in Late Victorian England. London: Virago Press, 1989. Winter, J. M. "Spiritualism and the First World War." In R. W. Davis and R. J. Helmstadter eds., Religion and Irreligion in Victorian Society: Essays in Honor of R. K. Webb. London: Routledge, 2001. Setta, Susan M. "Spiritualism." In the World Book Online [web site]. Available from www.aolsvc.worldbook.aol.com/wbol/wbPage/na/ar/co/525640 . "Spiritualism." In the Anomalies [web site]. Available from www.sonic.net/~anomaly/articles/ga00005.shtml . Stefanidakis, Simeon. "About the First Spiritual Temple: Hydesville." In the First Spiritual Temple [web site]. Available from www.fst.org/spirit4.htm . "The Story of Spiritualism." In the Newage On-Line Australia [web site]. Available from www.newage.com.au/library/spiritualism.html . Does anyone have any information Clifford William Potter or his family? They were involved in Spiritualism in England in the early 1900's and were known to Arthur Conan Doyle and Hannan Swaffer. When Clifford William died in Australia in the 1960's there was an article written about him in the Spiritualist papers in England.